to lead a team under his guidance to the playoffs. In past seasons, the name Ray Sheppard didn't mean much to Bill Guerin. Sheppard, who made his mark with the Detroit Red Wings in the 1990s, was just another guy Guerin played against in his long and successful NHL career. Now the two are linked, and Guerin wonders if that's a good thing. When the New York Islanders' captain scored his 20th goal of the season March 1 against Philadelphia, he joined Sheppard as the only two players in League history who have scored 20 or more goals with six teams. "You can look at it two ways," said Guerin, who also reached the 20-goal plateau with the Devils, Oilers, Bruins, Stars and Blues. "One is I bounce around too much, and two is I've been consistent, and I have." No. 1 happens. It's out of his control. No. 2 matters most. It has turned Guerin into a household name in the NHL. Guerin has played for seven teams during his 15 NHL seasons, but he's always found his niche, his role in whatever sweater he wears. It's all because he plays with a level of consistency that makes him a viable top line winger in any city. "I know it means I've moved around a lot. You know what, moving around is not easy," Guerin said. "It definitely affects your life on the ice and at home. There are certain things you have to deal with. I like to think through all of that I have maintained some consistency in my game and produced for whatever team I've been on." Only now, as he wraps up his first season on Long Island, Guerin has embraced an altogether different challenge. For the first time in his career he's a captain, the player every Islander is looking at as the team makes one final postseason push through March. "You do look to do a lot more because you have a lot of responsibilities, but your biggest responsibility is your play on the ice and being consistent in your effort," Guerin said. "If you're not going to do certain things on the ice, than nobody else should be expected to do it." Guerin has embraced his role and his new team. He hopes to finish his career as the Islanders' captain. "I don't want to go anywhere else," he said. "I'm too old to keep moving around." 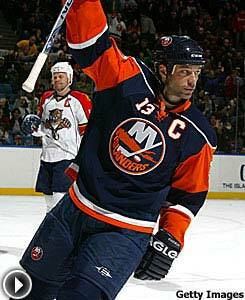 Through his travels, though, Guerin has had some of the best tutelage of any captain in NHL history. He won a Stanley Cup under Scott Stevens in New Jersey. He had Kelly Buchberger and Doug Weight as captains in Edmonton. Darien Hatcher and Mike Modano in Dallas. Dallas Drake in St. Louis. Patrick Marleau in San Jose. Guerin has taken bits and pieces from each to become the captain he is today. "Everybody has their own way," Guerin said. "Maybe there were one or two times when Scotty Stevens addressed the whole team, but he wasn't a talkative guy. His actions on the ice did all the speaking for him. Same as Kelly Buchberger. He wasn't a rah-rah guy, but he was there every single night for us. Everybody has their own style, so you have to just be yourself." For Guerin, that means being an affable teammate off the ice. Teammates can crack jokes with him -- even about how much he's traveled throughout his NHL career -- and know he can take it. After a recent morning skate at Madison Square Garden, Josef Vasicek was staring at a portrait of a famous clown who had once played the venue. Vasicek looked at Guerin, who was standing next to him outside the visitor's dressing room, thought the two looked alike and quipped; "Hey Billy, can you sign that for me?" It was a good rip. Guerin actually had no response. That's rare. "You can't really give Billy a good ribbing," Islanders center Richard Park said right before Vasicek got him. "He can give it back with the best of them." The jokes aside, Guerin takes his job of being the Islanders' captain seriously. He respects the organization and its history too much not to. "You have to keep it together," Guerin said. "We're in a tough situation right now, but you can't quit and you can't panic. You have to remain even-keeled and make sure everyone is comfortable." According to his teammates, Guerin's leadership has made them feel just that way. "He's probably one of the reasons this team came together so quickly," center Mike Comrie said. "We had a lot of new faces at the start of the year and he made sure everybody was included at every dinner and every function. We went away to Moncton (N.B.) at the start of the year for training camp, and he made sure everybody was a part of everything. We all stuck together as a result. Without a leader like that you probably don't have the success that we had early on as a team." "Everything that has ever presented itself to our hockey club he has really handled with a lot of honesty and dignity," Park said. "He's been straightforward and you really can't ask for anything more than that." Guerin's presence has also made coach Ted Nolan's job easier. "Guys who deal with a lot have that great experience, and one thing with Billy is he has a tremendous amount of leadership in him," Nolan said. "In order to be a captain it takes a little getting used to. It's a totally different role from being just one of the go-to guys in the room. All of a sudden you have a 'C' on your shoulder and you're working with the coach and the players and the refs. "It's a little bit different, but he's adjusted real well. From the start of the season until now you can see a whole different leader."